To mark the release in the Philippines of Hotel Transylvania 3: A Monster Vacation on August 22, 2018 and in collaboration with Sony Pictures Entertainment, Inc., Novotel Manila Araneta Center is offering fans of the movie the chance to stay in one of its Superior themed-rooms branded with the Hotel Transylvania 3: A Monster Vacation available between August 1 and October 31. 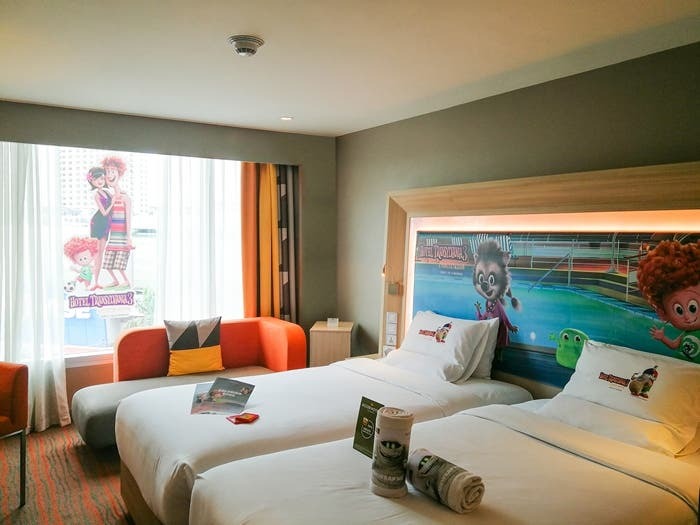 For a special family offer of Php 6,500 nett, an entire family of four composed of two adults and two kids ages 15 and below can enjoy a monsterrific staycation in a customized Hotel Transylvania 3 themed-room complete with special headboard, pillow and towel sleeves, glass stickers and doorknob hangers. Plus, all four will each receive a Gateway Cinema movie ticket and complimentary buffet breakfast at Food Exchange Manila. To maximize the experience, the young guests will be presented with Hotel Transylvania 3 welcome gifts upon arrival. Kids can also order at the Gourmet Bar and the 6th from our specially crafted Hotel Transylvania 3 inspired menus and mocktails which include Mavis’ Scream Cheese Pizza made with fresh tomatoes, basil and cheese and Dracula’s Favorite – a concoction of guava, lychee and cranberry juice with strawberry syrup. The experience continues online. If you believe that your family deserves a Monsterrific Staycation at Novotel Manila, just tweet the reason why @NovotelManilaAC and use the hashtags #NovotelFamily and #HotelT3 #HT3atNovotelManila. You might just enjoy the special monsterrific family staycation offer for free! This is a unique opportunity for children and adults alike to enjoy and share a fun family experience to remember! This collaboration, which is in line with Novotel’s Family & Novotel promise, will immerse everyone into the world of their favorite monster family. Booking period is from July 30 – October 31, 2018. For inquiries and reservations, please call (02) 990 7888 or email H7090@­accor.com. More information about Novotel Manila Araneta Center, its facilities and services are available via www.novotel.com, www.accorhotels.com, or www.novotelmanilaaranetacenter.com. Meme it to Win it!